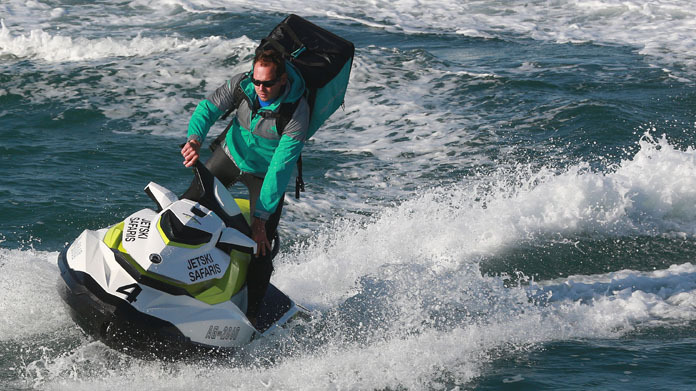 It’s been a case of sun, sand and err Jet Ski’s this week for the Deliveroo team, as we brought their latest innovation in delivery to life – by trialling Jet Ski deliveries off the South Coast. As August draws to a close, sun worshippers are all clambering to the beach to catch the last rays before the Autumn takes hold, making it the perfect time to unveil our trial service. A quick trip to Bournemouth to catch the deliveries in action, and we had ourselves a media story. The coverage came in waves with our images hitting METRO, The I, City AM and Daily Record in print; before the METRO (again), Daily Express, Mail Online, The Sun and Daily Star got in on the action. With media requests coming in from Hong Kong and The Netherlands, it feels like the splashes will keep coming for this one. Deliveroo are currently gathering feedback on the trial and could potentially make the service available nationwide in 2018… watch this space. All in all, a pretty good way to kick off the week!